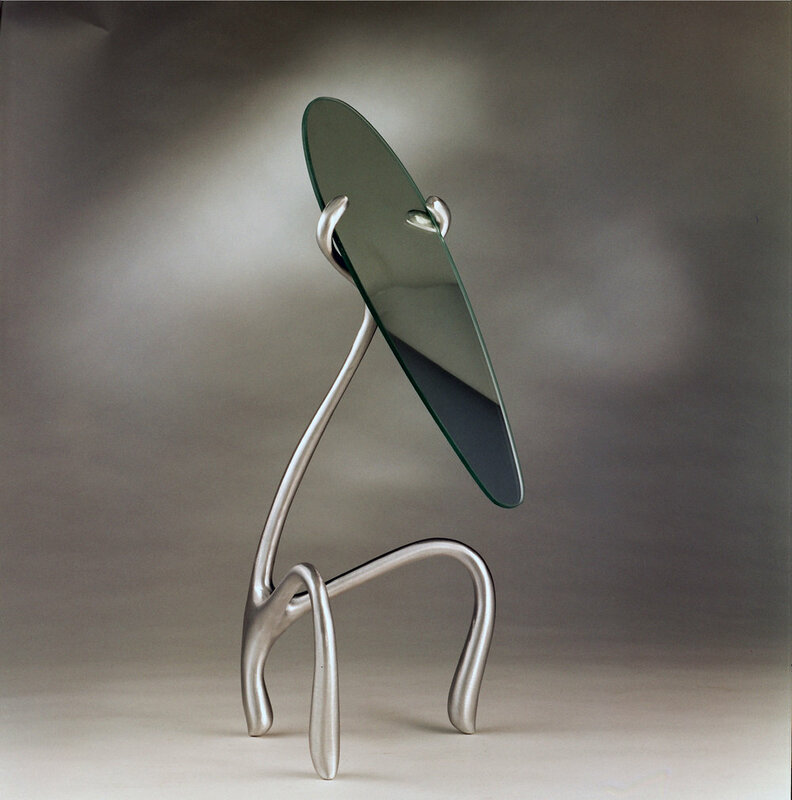 The GooseGuß ("goose-goose") table mirror was created in Chicago by Jordan Mozer (b. 1958) and his team for the conversion of an abandoned foundry into the East Hotel in Hamburg, Germany in 2004. It is 26” tall x 11 ½” wide x 12 ½” long (66cm tall x 29 cm wide x 31.75 cm long). Provenance: Collection of the artist. Signed. This cast, goose-neck mirror was created in Chicago by hand carving maple. The sculpture was cast in 92% recycled magnesium-aluminum alloy. It was then hand-polished and brushed. The GooseGuss tabletop mirror was created for the East Hotel in Hamburg Germany, a boutique hotel and restaurant which reimagined the ruins of an old iron foundry. Almost every architectural and design component was created using foundry process or imagery and techniques to evoke in guests the spirit of the former foundry and the feeling of discovery experienced by a Westerner in Asia for the first time. “Cast metal” in German is “Guss Metal”, (goose met-ahl). While working on the hotel Mozer lived in the old Goose Market. From this experience came the inspiration for the gooseneck form of the cast ("guss") mirror. Photos: Photos of the mirror by Tom Rossiter. Photos of East Hotel by Doug Snower. H 26 in. x W 12.5 in. x D 11.5 in.